If this is your first visit to octavia.net in 2015, you’ll see some real – and hopefully pleasant – changes. These include an expanded video section, featuring five new (entertaining & short) videos filmed on the beautiful Baltic island of Gotland, setting of The Hall of Tyr, in May 2015. This page also houses my original Circle of Ceridwen book trailer, and the beautiful trailer to my novella The Tale of Melkorka – which some have joked is longer than the novella itself. This new site offers special insights about the characters, places you can write to me, comment on the books, and of course, over 100 essays on Medieval Life, with special focus on the Anglo-Saxons and Norse peoples of the 9th century. It’s also a place where you can get your copy of The Circle of Ceridwen Cookery Book(let). This is a charming PDF of ten authentic, delicious, and easy recipes from the Saga. Octavia.net May 2000 – remember this? 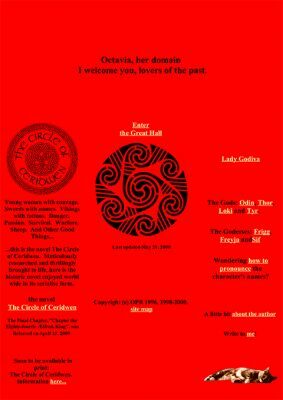 History is my specialty and great interest, so here’s a little background on the site: Octavia.net was created in March 1998 as a place to spotlight The Circle of Ceridwen, which at that point was the only book I had written. (That list has since grown to five novels and two novellas.) It was a simple HTML site, meant to be as easy and quick as possible for readers to access, as not only were these the days of slow modems, but many of my earliest readers were in foreign countries with even slower and spottier service than the US and UK. In 1998 there were very few author websites – in fact, compared to today, there were very few websites, period. Because I had done so much historical research in writing Circle, I wanted to share some of what I had learnt, and thus I began writing essays about especially interesting facets of what I had uncovered and absorbed. Much to my surprise and delight, the site soon became a popular destination for educational entities of every stripe and from many nations – everything from classes of third graders learning about Games and Pastimes of the Anglo-Saxons to philosophy students at universities investigating the concept of Wyrd. Today octavia.net hosts over 130 pages of information – it is quite a deep site. It is something I have worked very hard on, and I am proud of. Generous thanks are due the Technical Team who made the long and arduous transition from the old site to this new WordPress site a reality. The site was given its attractive form and design by Debra of Nettles Design, with additional technical refinements by a host of independent specialists, including Rafiqul, Pritpal, Hardeep, Attinder, and Afroza, who continues to work with me weekly. This large team was skilfully managed and coordinated by my own webmaster extraordinaire, Jonathan Gilman. If you enjoy my writing I hope you will also enjoy this new site, and become a frequent visitor. I’m now deep into the writing of Book Five in The Circle of Ceridwen Saga, so look for updates on that, as well. Thank you for your loyalty to my novels! 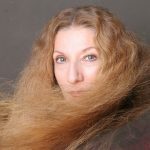 characters, the period in history, and your style of writing. Thank you for what you are adding to our upper middle age years. We are both in our 70’s. Rhonda and Sam – knowing there are readers such as you savouring my novels make all the effort, research, and time invested in them utterly worthwhile. I plan to keep writing for many, many years, and want you two along with me! We’ll be there if we are still here.